Part two of the Kissinger memoirs begins with his appointment as Secretary of State, in September 1973, and ends with Nixon's resignation, in August 1974. (A third volume, covering the Ford years, can thus be expected.) Kissinger professes to have been surprised by the appointment, reasoning that Nixon would not want a powerful Secretary of State. His clout as National Security Adviser he attributes practically to chance. Nixon, he thinks, saw him prospectively as an innocuous ploy, meant to undercut State; but his key role in dramatic events--the secret Vietnam negotiations, setting up Nixon's historic trip to China--turned him into a celebrity. The travails of Watergate then compelled Nixon to cede power to a forceful Kissinger in order to safeguard the foreign policy successes he so cherished for his reputation. Indeed, the weakening of the president by Watergate--and the ensuing "Kafkaesque," "surrealistic" atmosphere--is one of the volume's leitmotifs. 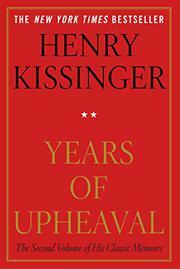 Kissinger resumes battle, though, over conflicts in the first volume. He is preoccupied with blaming Cambodia's ghastly fate on the North Vietnamese and the US Congress. The Lon Nol regime, he claims, consisted of the same personnel as Sihanouk's; and he compares Lon Nol's fall with that of Diem. Nonetheless he was negotiating with the Chinese to return Sihanouk to power when Congress undercut him by banning the further bombing of Cambodia--the only tool left him since Congress had also ruled out US military aid to the Cambodian government. The negotiations collapsed, and the fate of Cambodia was sealed. Against critics like William Shawcross, he presents a document supposedly setting out the truth of the bombing campaign to refute charges that its savagery led directly to Khmer Rouge savagery; this, however, is merely a self-defense by the then-US ambassador, and his Deputy Chief of Mission. On Chile, Kissinger still maintains that the US had no hand in overthrowing Allende, "an avowed enemy of democracy as we know it"; but since Allende was a man of principle, it would also be an insult not to assume that he intended to make good on his radical proposals. The details of Kissinger's Middle East shuttle diplomacy are here--as well as of the ill-fated Salt II negotiations: a victim of Watergate, in Kissinger's view, since only a weak president would have countenanced the wrecking tactics of Secretary of Defense Schlesinger. Watergate takes its final toll as Kissinger prays with Nixon on the last night--pondering the "biblical proportions" of his fate. Myth-making and self-justifying on a grand scale--but with fewer momentous happenings than in volume one.